How to transfer music from iPhone 7 to Mac? Here are some tips for you to import songs on iPhone 7 iOS 10 to Mac easily. Apple has ditched the standard 3.5 mm headphone jack and replaced it with the single lightning port at the bottom of iPhone 7, which means that you cannot listen to music on iPhone 7 with your lightning earpods when charging. To ease this connector jam, you can sync music from iPhone 7 to Mac for playback. Better yet, this will let you free up space on your iPhone 7 and backup your songs and playlists at one stroke. Via iTunes: Launch iTunes -> connect iPhone to your Mac -> click on Music in the left sidebar -> turn on Syncing -> choose the music content that you want synced -> tab Apply. Via iCloud: Go to Settings -> iCloud -> choose Storage & Backup -> turn on iCloud Backup -> click Back Up Now - > log in iCloud on Mac -> download iCloud music to Mac. However, it will come with some limitations using the above methods. 1. iCloud Music Library only works for songs that appear in the iTunes Music library. 2. iTunes might erase the music you've downloaded from the Internet or shared from friends. 3. iCloud free storage is limited to 5GB, so transfer task may fail due to storage shortage. Fortunately, you can copy music from iPhone 7 to Mac without any limitation using MacX MediaTrans. 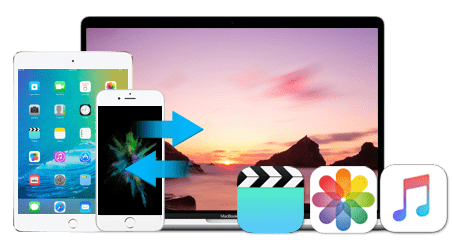 This iPhone to Mac transfer offers world's fastest file transfer speed and highest possible quality and is the best tool for you to export music, videos, photos and more from iPhone 7/6/5 to 2017 MacBook, MacBook Pro/Air and iMac. Before you start to copy music from iPhone 7 to Mac, you should free download the iPhone music transfer software on Mac computers. It supports the latest Mac OS, including macOS High Sierra and macOS 10.12. Step 1: Download & run this iPhone 7 to Mac transfer, and then plug your iPhone 7 to Mac. This program will automatically scan your iPhone and show device information on the main interface. Step 2: Click Music Manager to enter into iPhone 7 music transfer page. Then View the music list and select the songs you want to move out. Press "Export" to begin to transfer songs from iPhone to Mac. The whole process of music transfer will take only a few seconds. After that, you can click "Delete" to remove music from iPhone to save more space. 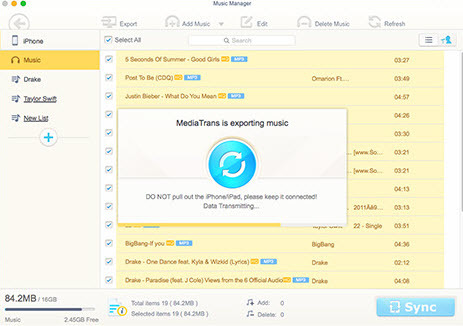 Besides an iPhone to Mac transfer, MacX MediaTrans also performs as an iPad and iPod manager that is able to transfer music to iPhone 8 from Mac/PC, as well as other files like video, photos, iTunes purchases, ringtone, iBooks, etc. Plus, you can also use it to transfer photos from iPad to Mac, etc. More importantly, it can turn your iPhone/iPad/iPod into a flash drive so that you can import any documents to your iDevices with ease. Best iPhone Music Manager to batch sync music from Mac to iPhone or vice versa, transfer playlist from Mac to iPhone, delete songs or create playlist on iPhone, etc. Follow this tip to fix iPhone stuck in recovery mode issue. Learn how to get iPhone 8 data recovery.